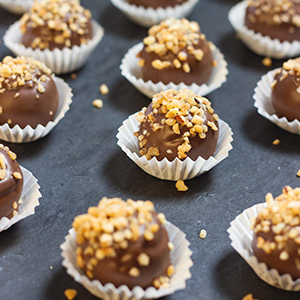 Hazelnuts paired with caramel and chocolate make these truffles a sure winner! Separate the eggs, placing the egg whites in one bowl and the egg yolks in another bowl. Beat the egg whites with an electric mixer until foamy and frothy. Gradually add the caster sugar and continue beating until the egg whites are shiny and stiff peaks form. In another bowl, beat the egg yolks with the icing sugar for 2 minutes until the mixture has thickened and is light and fluffy. Gently add the egg whites to the egg yolk mixture in three batches. Carefully fold in the flour, hazelnuts, baking powder and salt and mix until just incorporated. Pour the batter in the prepared baking pan, smoothing the top. Bake in preheated oven for 25 minutes, until a toothpick inserted comes out clean. Let the sponge cake cool completely. While the sponge cake is cooling down, start preparing the caramel sauce. Melt the sugar and butter in a saucepan over medium heat. Once the sugar is melted, reduce the heat to low. Do not stir the mixture, just swirl the pan occasionally. Watch the sauce and be careful not to let it burn. Wait for the sauce to turn golden brown. Carefully stir in the heavy cream and beat it vigorously. Be careful not to burn yourself, the mixture may spit. Leave it to cool before using it. Once the sponge is completely cool, crumble the cake into a large bowl. Add the cream cheese and cooled down caramel sauce. Mix it all together until the batter is smooth. Take a tablespoon of dough at a time and form a ball between your hands. In a heatproof bowl, melt your chocolate over a pan filled with water. Once your chocolate is melted, remove it from the heat. Dip your truffles into it and place them on parchment paper. Sprinkle hazelnut crunch on top. Let the truffles set and keep them refrigerated.